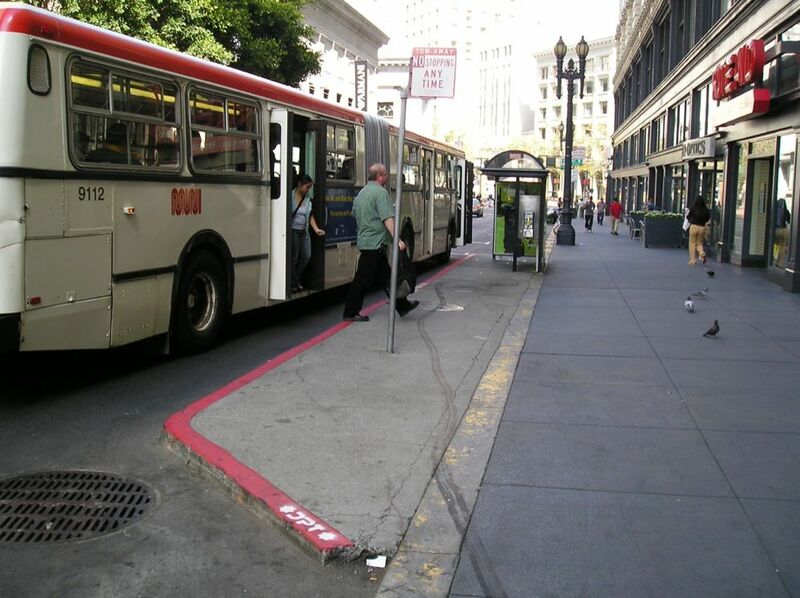 Bus bulbs are curb extensions that align the bus stop with the parking lane, allowing buses to stop and board passengers without ever leaving the travel lane. Bus bulbs help buses move faster and more reliably by decreasing the amount of time lost when merging in and out of traffic. 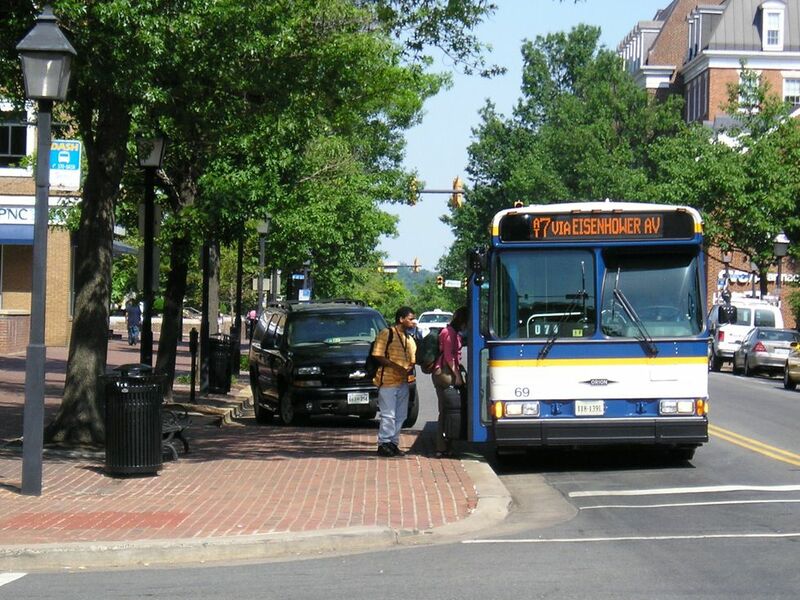 Bus bulbs may be combined with amenities such as wayfinding maps, plantings, and trees to enhance the overall transit user experience. Length and width of bus bulbs varies based on street geometry, vehicle types, and urban context. 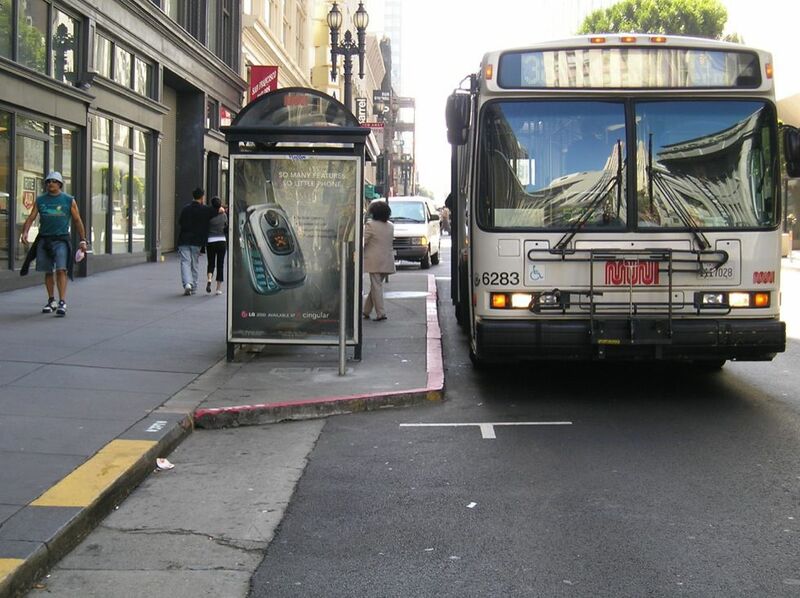 30-foot bus bulbs are widely used for non-articulated buses operating two doors. Longer extensions may be required for articulated buses and shorter bulbs may be possible for buses operating a single door. 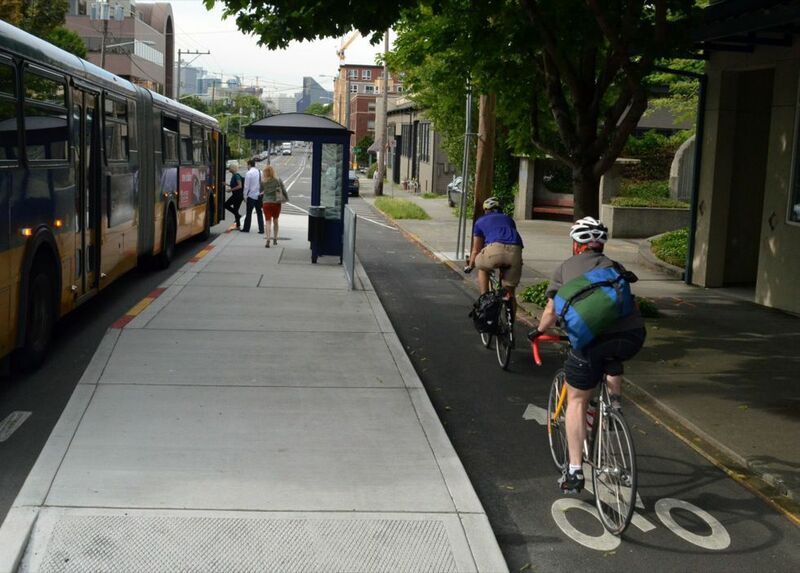 In Portland, Oregon all bus bulbs are 6 feet wide to provide a 2 foot “shy zone” between the bulb and the travel lane. Kay Fitzpatrick et al., TCRP Report 65: Evaluation of Bus Bulbs (Washington, D.C.: Transportation Research Board, 2001), 5. Cities should work with transit providers to determine the clear width necessary to deploy a wheelchair accessible lift onto the bus bulb. 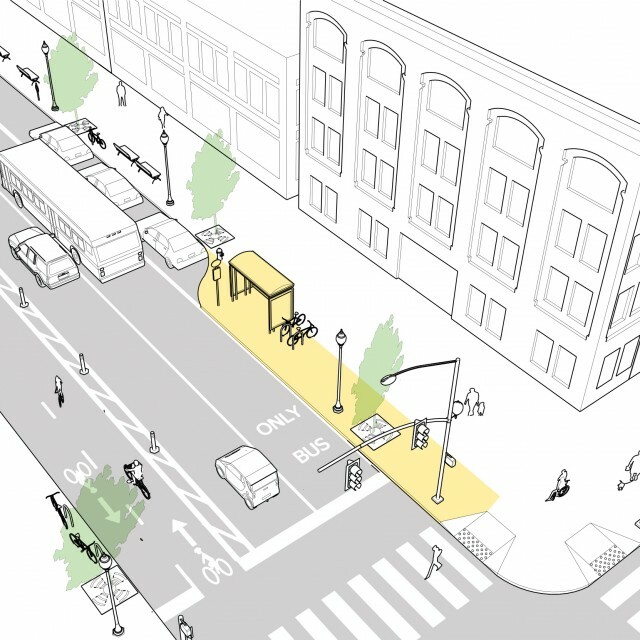 Use cut-throughs for curbside bike lanes and cycle tracks at intersections and midblock bus bulbs. Curbside bike lanes should not be dropped on the approach to an intersection with a curb extension. 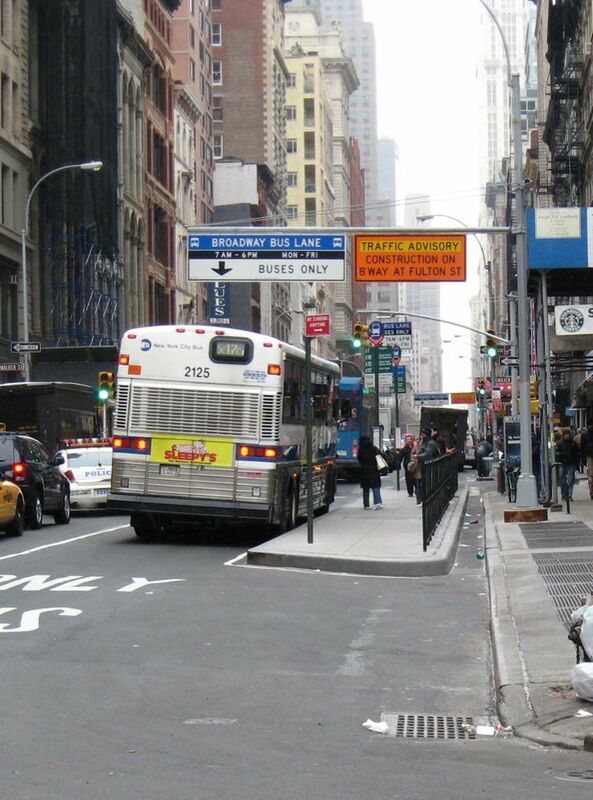 Where a rear side bus bulb is combined with a turn restriction, design the curb to self-enforce the turn restriction and monitor closely to ensure that transit vehicles are not suffering from delays. 1 Bus bulbs should be equipped with transit shelters whenever possible. 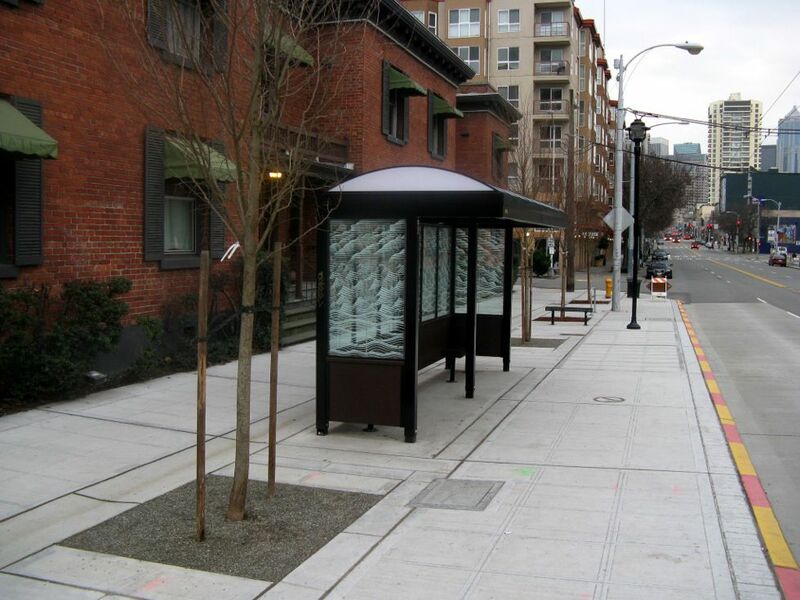 Shelters make transit more attractive and may be combined with off-board fare collection for faster payment options. When applied near-side, bus bulbs may require right turn on red restrictions where motorists are likely to queue in the right-hand lane. At these locations, enforcement is absolutely necessary to ensure that the curb extension serves its purpose successfully. Cities adopt different interior radii based on street sweeping, snow removal, and design priorities. Wide, curving radii, where space allows, facilitate street cleaning. Sharper angles preserve more on-street parking. 45-degree return angles allow for cleaning and preserve parking. San Francisco Better Streets Plan (San Francisco: City of San Francisco, 2010), 5.3. Best Practices for Pedestrian Master Planning and Design (Sacramento: Sacramento Transportation & Air Quality Collaborative, 2013), 14–15. City of San Francisco. 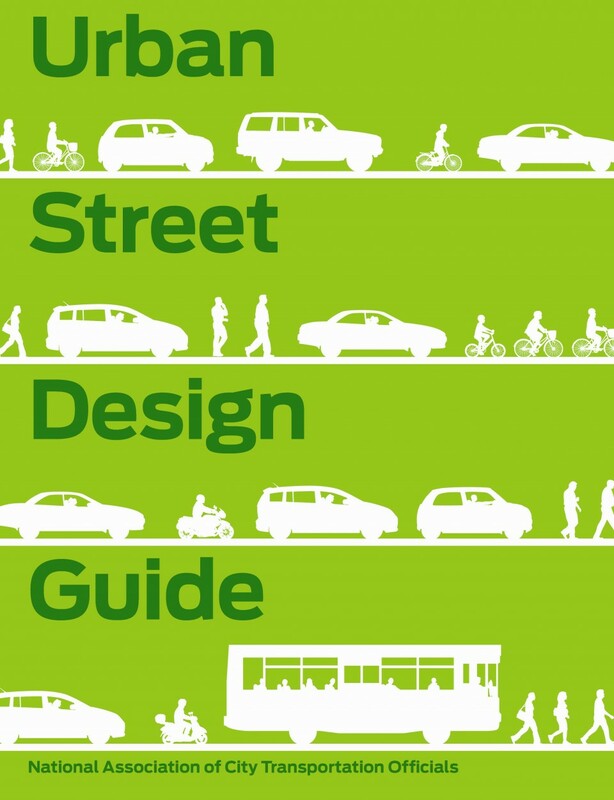 San Francisco Better Streets Plan. San Francisco: 2012. Fitzpatrick, Kay, Kevin M. Hall, Stephen Farnsworth, and Melisa D. Finley. “An Evaluation of Bus Bulbs on Transit, Traffic, and Pedestrian Operations.” Transportation Research Board TCRP Web Document 19 (2000): 1-161. Fitzpatrick, Kay, Kevin M. Hall, Stephen Farnsworth, and Melisa D. Finley. “Evaluation of Bus Bulbs.” Transportation Research Board TCRP Report 65 (2001): 1-39. Sacramento Transportation and Air Quality Collaborative. 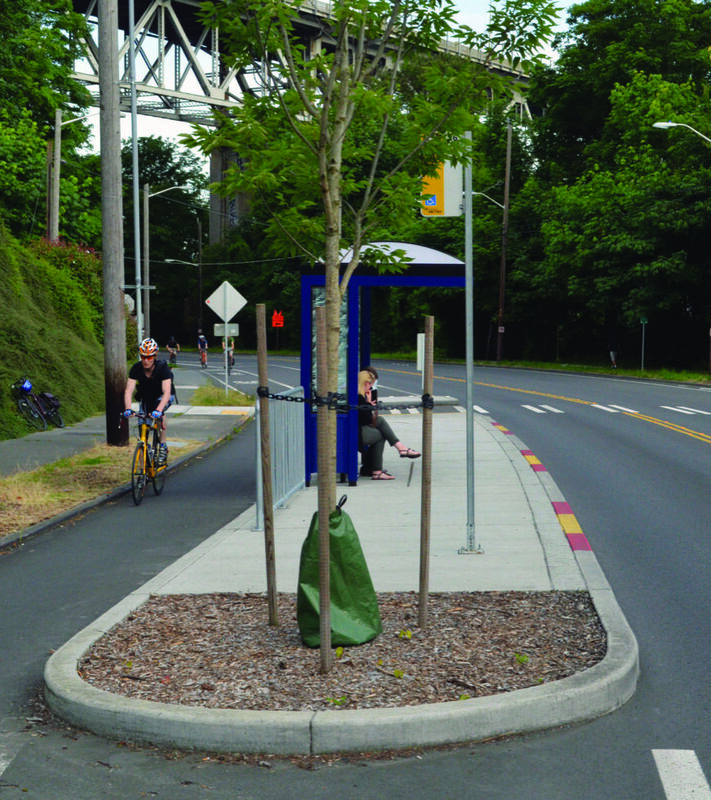 Best Practices for Pedestrian Master Planning and Design. Sacramento: 2005. References for Bus Bulbs: 4 found. Transport for London. 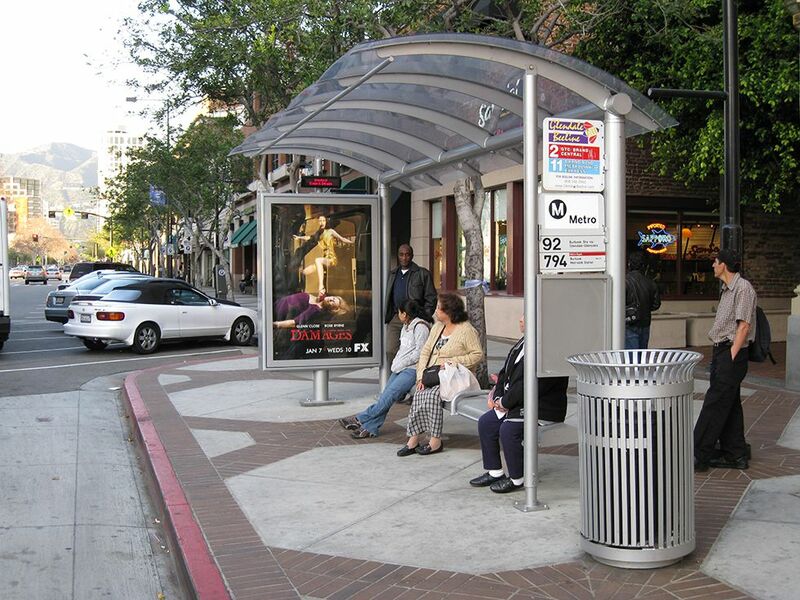 "Accessible bus stop design guidance." Bus Priority Team technical advice note BP1/06, Transport for London, London. Fitzpatrick, Kay, Kevin M Hall, Stephen Farnsworth, & Melisa D Finley. "An Evaluation of Bus Bulbs on Transit, Traffic, and Pedestrian Operations." TCRP Web Document 19 1-161, Transportation Research Board, Washington, DC. Aladjem, David, Mike Barnbaum, Carol Borden, Mary Brill, Lea Brooks, Margaret Buss, Tim Cahill, et al. 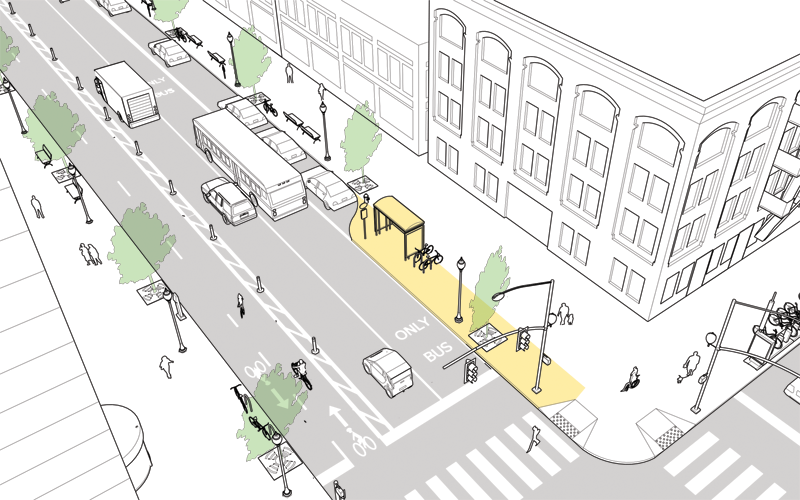 "Best Practices for Bicycle Master Planning and Design." Sacramento Transportation & Air Quality Collaborative, Sacramento Transportation Authority, Sacramento, CA. Varat, Adam, & Cristina Olea. 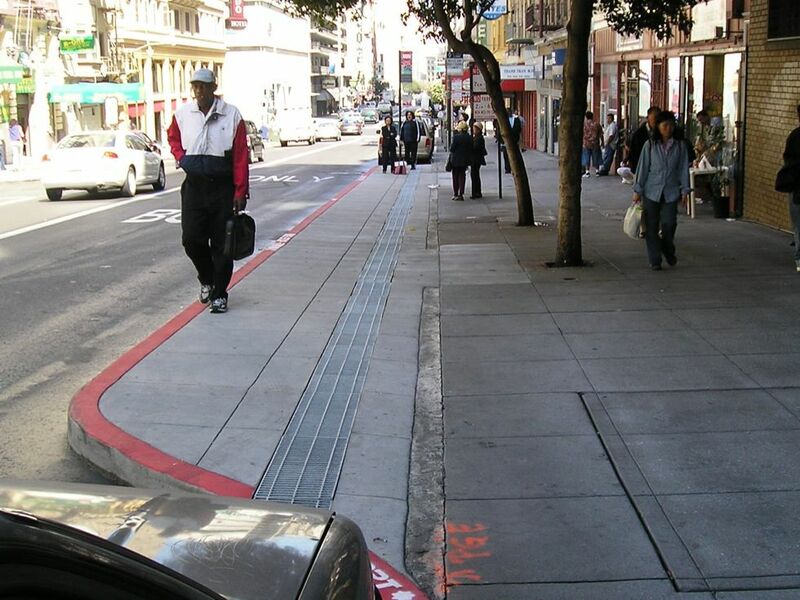 "San Francisco Better Streets Plan Policies and Guidelines for the Pedestrian Realm." Planning Department, & Municipal Transportation Agency, City of San Francisco, San Francisco, CA.